The majority of visitors come from India, United States, Pakistan & United Kingdom. Topics: Animals, Reference, Quizzes, Games, Phobia Filter, & Contribute. 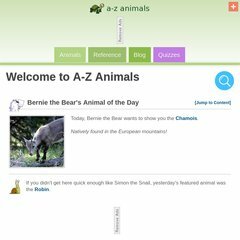 a-z-animals.com Glossary - Reference - A-Z Animals - Animal Facts, Information ..
a-z-animals.com Gary the Goat's Games - A-Z Animals - Animal Facts, Information ..
a-z-animals.com Contribute to A-Z Animals - A-Z Animals - Animal Facts ..
a-z-animals.com Octopus (Octopus Vulgaris) - Animals - A-Z Animals - Animal Facts ..
2,246 users visit the site each day, each viewing 3.00 pages. auntannie.com Aunt Annie's Crafts - Crafts and more, for all ages! The programming language environment is PHP/5.2.11. It has 2 DNS records, ns2.servint.com, & ns.servint.com. It is hosted by Servint (Virginia, Reston,) using Apache/2 web server. PING www. (64.131.80.6) 56(84) bytes of data. The server is slower than 44% of measured websites, at 1650 milliseconds. Also a time of 32.9 ms, is recorded in a ping test.